During this years visit to AirVenture in Oshkosh, very little time was spent at the flight line compared to past years. Unlike prior years, this year my wanderings around the show took on more of a “tunnel vision” man on a mission visit. First priority was visits to the Garmin and Dynon booths. In a previous post, I mentioned the switch being by Van’s from the Garmin SL40 radio to the new Garmin GTR200. The new Garmin radio has a built in intercom with 3D stereo sound. Because an intercom is built in, the GRT200 eliminates the need for an intercom unit on the RV-12 panel, thus freeing up space for other goodies such as backup instruments. I was eager to hear the sound quality of the new GRT200 with 3D sound and happy to report it sounds clean and crisp … so feel it will be a great addition to the RV-12 panel. The 3D sound makes it very easy to differentiate between active com audio, standby com audio (when monitoring is selected) and the intercom ... because communications from the active com frequency will be heard at the 11 o’clock position, standby com audio is heard at the 1 o’clock position and intercom audio from the right seat copilot is heard at the 3 o’clock position and of course, stereo music is heard as normal. However, to take advantage of the 3D sound feature, a stereo headset is required. Very cool!!! Next it was on to the Dynon booth to inquire about the compatibility between the new Garmin GTR200 radio and the SkyView. I was told by the Dynon representative that Dynon had tested the SkyView with the Garmin GTR200 and am happy to report the SkyView can talk to the GTR200 and push radio frequencies from the SkyView screen to the GTR200’s standby frequency just as it does with the Garmin SL40. That was great news! I was given a demonstration on how easy it is to set the standby frequency at the push of a button and it is truly a nice feature. No need to fiddle with knobs on the radio … truly slick! While at the Dynon booth information was also gathered on the SV-ADSB-470 weather and traffic receiver option recently offered by Van’s to enhance the capabilities of the SkyView. One of the questions I had was how much traffic information is displayed on the screen …. my concern was when in high density areas there may be an overload of information on the screen. 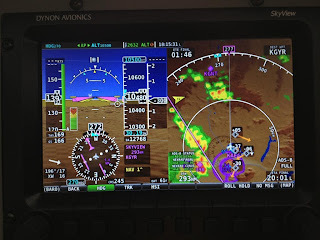 The Dynon representative said in an effort eliminate clutter on the screen and to only display meaningful information, only traffic within 3,000 feet of the airplane’s current altitude is displayed … this totally eliminates commercial traffic flying at much higher flight levels from being displayed. The display also shows an orange arrow associated with the traffic … this is the projected path of the traffic as projected by the SkyView software for the next minute. Below is a great photo posted on one of the RV forums by Karl an owner of a RV-8 equipped with a Dynon SkyView outfitted with the SV-ADSB-470 weather and traffic receiver. The photo was taken in-flight near Albuquerque and shows how the SkyView displays both weather and traffic. displaying ADSB weather and traffic on the right half of the screen. Clicking on the above photo will enlarge it so the traffic can be seen clearly. In the photo above, Karl reported that the storm system the purple line is going through is exactly what saw to the left of his airplane. Aircraft traffic is displayed as diamonds (there are four displayed) and next to each diamond is an orange arrow and a + or - number. The arrow is the predicted path of the aircraft for the next minute. As an example, the aircraft just ahead and to the right of Karl’s RV8 is +05 with an orange arrow pointing to the southeast … this aircraft is 500 feet higher than Karl’s RV-8 and the SkyView software predicts the aircraft's path to move in the direction and length of the orange arrow in the next minute. Frankly, I feel this is a fabulous tool … granted not fool proof because there are times the traffic signal can’t be received due to non coverage, but the FAA is continuing to add more and more transmitters, so perhaps one day soon the traffic coverage will be just about nation wide. Plus, price is right … free, as long as you have a receiver and there is no monthly data fees as with XM satellite service. But to be fair to XM, their coverage is nationwide and they offer much much more information in addition to weather and traffic. On the engine front, there were a couple of great looking RV-12’s that had engines other than the Rotax 912ULS. I spotted one UL instillation and one Viking instillation. The UL instillation used a cowling made for a RV-12 Jabiru engine instillation coupled with a custom made engine mount. I really like the UL because it is a 3000 RPM, dual ignition, FADEC controlled fuel injected, air cooled, aircraft engine without gear reduction which can burn automotive fuel and runs independently of the aircraft’s electrical system. A lot to like. 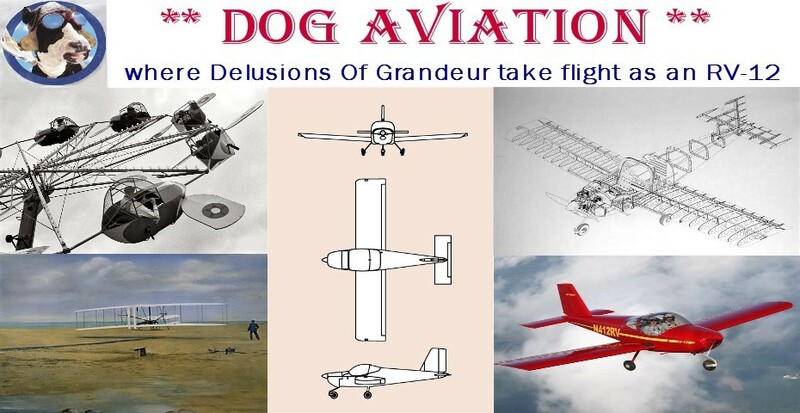 engine is a direct drive, fuel injected aircraft engine made in Belgium. The duct attached to the aft end of the UL’s baffling supplies air to an oil cooler. The Viking aircraft engine is comprised of parts from three Honda engines ... the Honda Fit outboard marine, 2009 Honda fit power train and Honda fit racing engine. The engine is rated at 110 hp @ 5500 RPM. The Honda Fit engine is capable of running at very high RPM’s, so the Viking engine controller was designed to limit the engine to a maximum of 6,000 RPM. Because the Viking is based on an automotive engine, there is only one ignition system or spark plug per cylinder. Due to the Viking’s high RPM’s, the Viking engine utilizes a solid looking gear reduction unit which is geared at a 2.34:1 reduction ratio. Engine cooling is obtained by way of an oil cooler and cooling radiator using NPG coolant from Evans (which has almost zero pressure in the coolant system). Viking has firewall forward kits available for the RV-12 including the cowling. for baffling since the engine is 100% cooled by coolant and oil radiators. The Viking engine is a compact and clean instillation. Unfortunately for me, I’m destined to install a Rotax engine. Hind sight being 20/20 I should have started on the fuselage before the wings which would have kept engine options open. Why do you ask? The RV-12 is unique among airplanes in that the pitot tube on the RV-12 goes through the center of the gear reduction unit, propeller mount, and protrudes through the center of the spinner to capture undisturbed air from in front of the propeller for the airspeed indicator. This unusual mounting location was chosen by Van’s to facilitate easy removal of the R-12’s wings without the need to disconnect any plumbing. Pitot tubes should be installed in undisturbed air as much as possible, so they are typically installed under a wing, outside of the influence of the prop wash and near the leading edge. If I were to decide on an alternative engine to the Rotax, it would necessitate removing the skins from one of the wings to install the pitot tube and supporting plumbing … which at this point in time, I’m not inclined to do. But wait, Rotax has a new fuel injected engine! The new 912iS which is an upgraded 912ULS engine with redundant fuel injection system, ignition, and ECU control. There are also two alternators built into the engine now with automatic rollover upon failure of one to keep the dual fuel pumps running, plus the new alternators boast a higher amperage rating for the overall aircraft load. The new Rotax 912iS fuel injected engine. 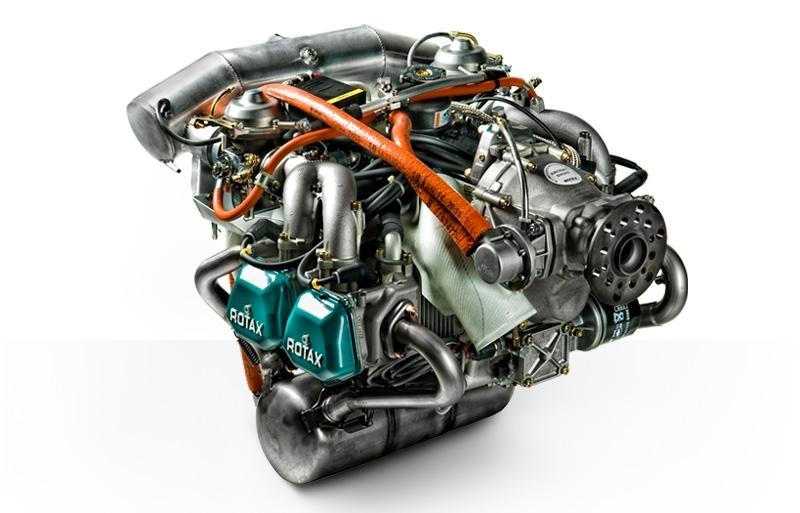 The Rotax 912ULS for comparison … the RV-12 does not use the round air box on the rear of the engine. 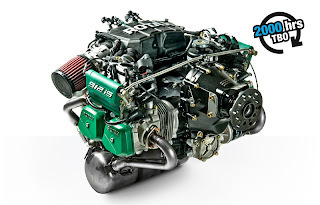 The new 912iS engine clearly does not have the same shape as the carbureted 912ULS. It was mentioned in the forums that the RV-12 cowling will hit the 912iS, where I’m not sure. However, it would be tempting to reshape the cowling in the areas of the interference if it is not a huge misfit. Then of course there is the weight penalty … the new ECU controller, dual injectors, dual electric fuel pumps, bigger alternator and supporting hardware add at least an additional 13 pounds. However, if one of the new much lighter Shorai batteries were used, one could save 11.5 pounds over the standard Odyssey battery which virtually negates the extra weight of the 912iS. Tempting very tempting.